It’s as if the Eskimos and Stampeders just couldn’t wait for the regular season. An early edition of the Battle of Alberta commences Saturday at McMahon Stadium, as the Edmonton Eskimos and Calgary Stampeders open their 2016 pre-season slate with a familiar rivalry. The heat has been turned down considerably since last November when they played in the Western Final – a 45-31 Eskimos win at Commonwealth Stadium – but many of the familiar faces will be present. Mike Reilly and Bo Levi Mitchell have each been named the starters for Saturday’s contest, though it’s unclear how many snaps they will take. The same is probable for Reilly, as both teams want to find that balance between getting the first team offences comfortable and getting them off the field fully healthy. For Dickenson and Eskimos head coach Jason Maas, it’s the first time either has dealt with such a conundrum. Both are in their rookie season as a CFL head coach, as Dickenson gets the promotion from within while Maas arrives in Edmonton via the Ottawa REDBLACKS. Both were offensive coordinators last season. “It’s gonna be a game for me,” said Maas, a new face in the rivalry this year but as a long-time Eskimos quarterback no stranger to the Battle of Alberta. Maas will have no doubt have his hands full in his first taste of head coaching action. “I’m going to be calling the game offensively, situationally, special teams-wise and talking to Benevides to see where we’re at situations-wise,” he said. Maas isn’t the only new coach in Edmonton as the Eskimos will debut almost an entirely new staff on Saturday. Chris Jones took Stephen McAdoo and several others with him to Saskatchewan just weeks after winning the Grey Cup last season, leaving plenty of vacancies on the Esks’ sideline. The Eskimos are still expected to contend for a Grey Cup this season, but with so many moving parts, this training camp and pre-season is an important time for players and coaches to get on the same page. It could lead to the Eskimos’ regulars playing longer than the Stampeders’. “I think it’s definitely important for me to get at least a couple of snaps in this game just to get back into the swing of things but also get back into how we’re going to operate on the field,” said Reilly. The Eskimos will line up most of their expected regulars on the offensive side of the ball, including free agent signing Joel Figueroa at left tackle, Jacoby Ford in Kenny Stafford’s old position and Chris Getzlaf also in the slot, although Adarius Bowman is missing on the Esks’ listed depth chart. A number of starters will be absent on the defensive side of the ball including JC Sherritt, Almondo Sewell, Odell Willis, Marcus Howard and Cauchy Muamba, as the focus there for Maas and Defensive Coordinator Mike Benevides turns to competition. Kenny Ladler and Deion Belue are among early pre-season favourites to win starting jobs on the Esks’ defence, as voids have been left by the departed Aaron Grymes, Otha Foster and Dexter McCoil. 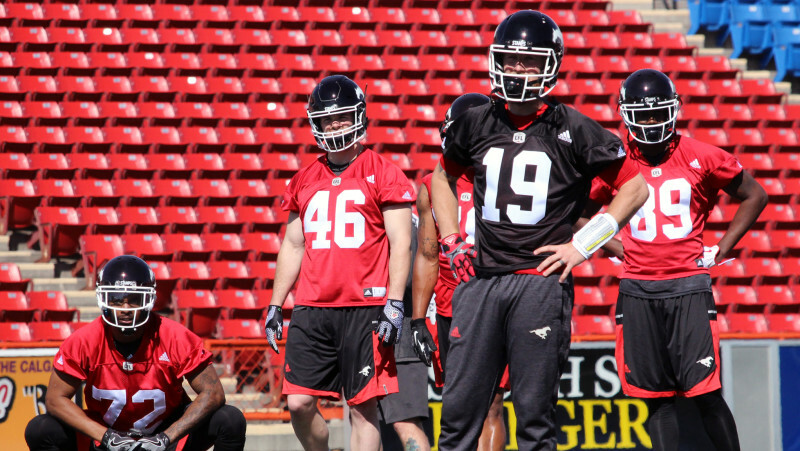 The Stampeders have gone through plenty of change as well. Saturday night in particular marks the debut of a new-look receiving corps now without Eric Rogers and Jeff Fuller, as Marquay McDaniel, Kamar Jorden, Bakari Grant and Joe West should all play a role. The biggest battle for playing time may come from national receivers, as Dickenson has said at least one will start this season and Anthony Parker, second-year Lemar Durant and Simon Charbonneau-Campeau are all up to the task. While Max Caron is locked in a battle to start at middle linebacker with Taylor Reed, another position to keep an eye on throughout Saturday is the O-line. Shane Bergman and Pierre Lavertu won’t play, leaving rookie international Alex Fifita to start at left guard and 2016 draft pick Roman Grozman at centre. So far Grozman’s transition at the position has surprised almost everyone, but whether he can continue that in the game is a different question. “He’s been better than I think we imagined,” said Dickenson. “We were happy where we got him, we thought he’d be gone. But with our injury situation he’s been a blessing. The Stampeders relied heavily upon their O-line depth to get through last season, and it looks like more the same early on in 2016. Also keep an eye on the return game, where a battle to become the team’s primary kick returner ensues, while Bryant Moniz and national Andrew Buckley battle it out to be the team’s third string quarterback. While many Eskimos coaches and Stamps head coach Dickenson are debuting in new positions, the same goes for Stampders defensive coordinator DeVone Claybrooks, who earned a promotion in the off-season to defensive coordinator to fill in for the departed Rich Stubler (Toronto). The Stamps and Eskimos shared the best regular-season record in the CFL last season with 14-4 marks, also sharing identical records at home (8-1), on the road (6-3), against the West (8-2) and against the East (6-2). Calgary led the West with 478 points scored while Edmonton was second at 466. The Eskimos and Stamps were the league’s stingiest teams with 341 and 346 points allowed, respectively. This is the first pre-season contest between the provincial rivals since June 15, 2012, when the Stamps pulled out a 20-17 win on a last-play field goal by Rob Maver. The Stamps had tied the game with 1:06 left to play thanks to a touchdown pass from Brad Sinopoli to Marquay McDaniel and then a successful two-point convert pass with the same two players. The Stampeders defeated the Eskimos on Labour Day last season but the Eskimos went on to take the season series, then after defeating Calgary in the Western Final claimed the 103rd Grey Cup Championship with a win over the Ottawa REDBLACKS.